mounted, valve or transistor, we can repair it! At Guitarlodge we have vast experience in repairing musical instrument amplification. Since establishing our repair & maintenance service commercially in 2008 we have gained many loyal customers from all over the country. We specialise in valve amplifier repairs & regularly work on brands including Mesa Boogie, Marshall, Soldano & Cornford amongst others. Our amplifier technician Dave Parker has restored many classic vintage amplifiers & hand-built an array of high quality valve amps for musicians & HIFI enthusiasts alike. His knowledge & experience in this field is second to none. Whether you bring your amplifier to us in person or send via our courier, its always in safe hands. Every amplifier worked on at our repair centre is treated with the utmost care & fully insured whilst on our premises. All our repairs are guaranteed (see terms & conditions at bottom of page). Our testing procedures are extremely thorough & electrical safety is something we take very seriously. Electrical safety checks, PAT tests & detailed work reports are included as standard with every amp we fix. Repair case studies can be viewed in the gallery. If you are contacting us about a repair or think there may be a problem with your amp & require advice, please help us by giving details of make-model & an accurate description of any symptoms. Certain symptoms can be a sign your amp is in need of a service, particularly on valve equipment. Photographs are sometimes useful & often required if your enquiry relates to external damage to an amplifier, a rebuild or restoration project. As always it is better to arrange an appointment at our repair centre (whenever possible) where we can discuss your repair needs in greater detail. No-obligation quotes can only be given in certain cases & any pricing details for our amplifier repair services should be used as a guide only. Please see our terms & conditions (bottom of page) for information on after sales support, labour charges & turnover times. WARNING! Please do not attempt repairs on amplifiers unless you are qualified to do so! We have various safety measures in place when handling this type of equipment. Certain components on valve circuits can store around 450 VDC for several hours after disconnection from the mains supply! Before powering up: We always check earth connections & fuse ratings prior to powering up any amplifier. Lifting of the main earthing conductor is something we see regularly & this presents obvious dangers! Normally disconnected inside the mains plug in an attempt to eliminate hum or interference. Yes hum is annoying, but it’s certainly not worth risking your life over! . Safety & dangerous faults: Any amp can become dangerous but the common problems we encounter are normally down to carelessness, poor manufacturing or the effects of time. Older vintage type equipment can often fall short of modern safety requirements. Amplifiers that were built decades ago when safety standards were far more relaxed, often become dangerous to operate & have the potential to cause electric shock or even fires! They may have been neglected or repaired many times over the years, & can hide some serious safety shortfalls including incorrectly rated fuses, bare exposed wiring, heat damaged insulation & insufficient airflow due to excessive dust etc. Most modern amplifiers are safer than ever before, although we still find incorrect fuses & potential safety issues where components have overheated due to being underrated. This can often result in the breakdown of insulation on mains & HT rated wiring! Intermittent faults: Frustrating for all parties concerned, but the fact is you cannot repair a fault that isn’t there! We often find ourselves listening to & testing amplification in the hope that an apparent on-going fault will show it’s self, sometimes it does, often it doesn’t! As with any electronic equipment, when components begin to break down they can become unstable, sometimes presenting some unpredictable behaviour. Noisy crackly control pots: These can cause changes in amp tone, hiss or hum, signal break-up, distortion & associated functions like volume, reverb, EQ etc, to become intermittent or stop working completely. Pots are cleaned during a standard service usually with good results, but replacement is sometimes necessary. Bad connections: Frequently down to dry solder joints, cracks on PCB boards, push-in board connectors that have worked loose from vibration, faulty switches or jack sockets & corrosion. Symptoms are wide ranging but can include intermittent faults, such as low or lost output, popping, banging when using at high volumes & failure of certain control functions. Electronic component faults (semiconductors): Resistors, diodes, transistors, capacitors & chips. Faults on these & similar components can be harder to trace, mainly due to their varying reactions to temperature, voltage & load conditions. Faults can be responsible for inexplicable changes in amplifier operation & are often harder to locate in preamp circuits. It can sometimes be easier & cheaper to replace an entire PCB than trace & repair electronic faults. No output (Blown fuses): Blown mains or HT fuses are a warning there is a fault & something is drawing too much current, or there has been a power surge due to incorrect voltage at the mains supply. 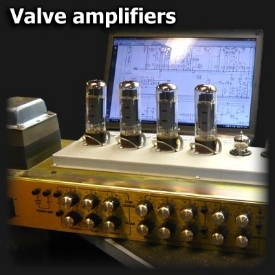 On valve amplifiers an arcing or shorted valve is often to blame & can stress or damage other components. These over-current related shut-down faults mostly derive from the output stage of the amplifier where higher currents, loads & temperatures can put considerable strain on components. We regularly replace blown mains transformers that are underrated & intentionally manufactured smaller to save chassis space. These can fail under excessive load, or various short circuit conditions. A dead short across a valve for example can easily create enough current to burn out a mains transformer! One more reason to ensure protection fuses are always correctly rated! Valve problems: We have mentioned many symptoms associated with worn or faulty valves, but there are other signs they may need replacing. Changes in tone, lack of punch & clarity are often tell tale signs that valves are on the way out, along with unwanted additional harmonics when valves turn microphonic. Re-valving is common practice on valve amps & often necessary during servicing. Only matched high quality valves are fitted on our amplifier repairs. We always test all valves (if applicable) & only replace if necessary. (see amplifier servicing page). Structural damage: Internal & external damage from being dropped, general wear & tear or being thrown in & out of a van for years, can take its toll on an amplifier! We have seen all kinds of chassis & exterior damage, usually accompanied by rattling parts inside hanging on by one screw when there should be four! Vibrations caused by continued use at high volume levels & prolonged rough treatment account for a large percentage of our work. Damage we’ve seen over the years includes, broken or missing handles, corrosion from poor storage, snapped off pots & switches, ripped speakers, water/beer damage, jammed internal cooling fans, broken casings, twisted speaker baskets, missing corner protectors, guards & grills. Small practice combos (Modelling & DSP): With many manufacturers turning to built in effects processing & amplifier tone-clone modelling in order to make their products more tempting, versatile, lighter & computer compatible, its no surprise that repairing these feats of modern technology often has more to do with computer software & electronics than amplification! We receive regular enquiries relating to DSP (digital signal processing) practice amplifiers that have effects-PCB faults & frequently they are just out of warranty & uneconomical to repair. Replacement parts are often expensive & can be very difficult to acquire. Although certain repairs are still possible, unfortunately we frequently end up referring customers directly to the manufacturer! Encompassing many of our aforementioned repairs & procedures, along with some additional, often intriguing research & investigation work, vintage amplifier restoration requires a wealth of knowledge & experience. There is still a great demand for these older, reassuringly heavy, built to last, classic tone-packed amplifiers amongst musicians, players & collectors the world over. Restoring your amplifier to its original condition (where possible) & maintaining its value are our top priorities. Classic amp tone derives from good old-fashioned build quality & carefully produced components. Preservation of original vintage tone is of the utmost importance & we only ever replace parts on restorations when absolutely necessary. Restoration issues: Working on any old out-dated electronic equipment involves obvious pitfalls & vintage amplification is no exception! The effects of time often include chassis corrosion, degradation of electrolytic capacitors, resistors, output transformers, transistors & cable insulation, missing original parts, corroded valve pins (making removal difficult) & general structural wear & tear. (Pictured right) VOX AC50 Pre-restoration. Replacement parts: We stock many components & have access to numerous amplifier schematics old & new at our repair centre. Gaining plenty of useful contacts over the years has enabled us to source some of the most obscure amplifier parts. Unfortunately often certain parts are no longer available either due to manufacturers updating designs & discontinuing older models, or going out of business! Sourcing equivalent parts, repairing or making new components is often the only solution. In addition to our own repair facilities we frequently use professional repair specialists for rewinding transformers, speaker re-coning & voice coil rewinds. Of course not every restoration requires new components, in fact original vintage valves are often re-fitted after testing! We never change or remove perfectly good functioning parts during a restoration. Arranging a restoration: Please contact us if you wish to discuss a restoration or rebuild on an amplifier. Because the possibility of long time-scales, high costs & ordering of often costly parts are synonymous with this type of work, we will always ask you to visit our repair centre (whenever possible) where we can discuss your requirements in detail. Our amplifier technician Dave Parker can be contacted on 07833 997221. Email: Info@guitarlodge.co.uk. Please note deposits may be required in certain cases. We can only modify amplifiers using manufacturer authorised schematic drawings & components. With so many potentially tone-wrecking & sometimes amp destroying modifications floating around on the Internet, we have been forced to limit this service & are sorry for any inconvenience. We are happy to modify, or reverse any modification you may have had on your amp, providing it’s on our terms. Charges: Our rates for repairing amplifiers are £30 for the first hour, this is our standard minimum bench fee for all amp related repairs-servicing & then £25 per hour there-after. We cannot give accurate quotations on repairs but will do our best to give a guide price once we have done some tests on the bench, although please remember other faults can & often do emerge during the repair process. Labour rates include any minor parts that may be required, larger items like filter capacitors & valves etc are not included but we offer good prices on these & many other amp parts. Amplifier restorations can involve many hours of labour & sourcing of often hard to find, or expensive parts. We will always do our best to give a guide quote in these circumstances & keep you informed on progress. Deposits may be required on certain amp restorations. Your budget: We promise to only charge for the labour time & parts necessary to service/repair your amplifier. Whilst we cannot give estimates for this kind of work very easily as so many variants make it difficult, we will always advise honestly & discuss (if need be), the possibility of high costs, & never surprise you with a hefty bill. Your guarantee: We always guarantee our work on amplification for a period of 3 months from the date of collection. Please be aware this only applies to components we have fitted & repairs-procedures we have carried out during the servicing/repair of your amplifier. New un-related faults & problems are not covered, neither is damage due to misuse. Turnover times: Repairs can normally be completed within a few days providing there are no extensive major faults that need attention. However we recommend allowing a week between drop off & collection just in case specific components need ordering. Although we stock many spares, certain parts still have to be ordered. If we cannot stick to the agreed turnover time for any reason we will contact you. Restoration work can take several weeks & any turnover predictions should be used as a guide only. Uneconomical to service/repair: Please do not bring your amp to us if you are not willing to spend £30 to find out that it’s uneconomical to repair! We have become a throw away society! Small DSP equipped practice combos & modelling amps for example are prone to (software-like) problems including random erratic control issues, & on-board FX PCB faults. Although a repair can often involve mere replacement of electronic FX cards & certain chips, it’s often not cost effective. We always assess any repair/service request on its own merit. If in our opinion an amplifier repair would not prove cost effective, we would inform you. In the event that we have already commenced work on an amplifier & feel repair costs could spiral out of control &/or its no longer financially viable to proceed with a repair/service, we will contact you. Collection of amplifiers: Amplifiers must be collected within a period of 8 weeks (with the exception of restorations & rebuilds). Sometimes we are left with amplifiers in our workshop (repaired & un-repaired) & whilst every effort is made to contact the customer, often we either lose the repair fee & keep the amp or just end up using it for spares. Please inform us before any work commences, if you know you are not going to be able to collect your amp for several weeks due to travelling or other reasons. Payment: All bills will be settled upon completion of work to your satisfaction. Payment will be required upon collection of amplifier(s). We will only dispatch your amplifier(s) once payment has cleared (courier service only). Details of payment methods can be found on our prices page.